A number of apps have been developed by other companies for use with the Concept2 Performance Monitor. These apps are not developed by Concept2, and we do not offer service or support for them. However, they do offer a variety of additional features and functions, which may add to your workouts. For more information or support on these programs, please contact the developers directly. Important: Check the system requirements to ensure your Performance Monitor is compatible. 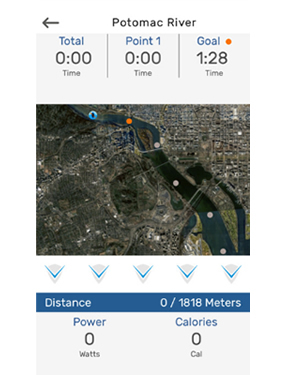 BoatCoach is an Android application that can be used both indoors on the Concept2 Indoor Rower and outdoors for sweep and scull. 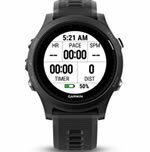 Features include a fully-customizable user interface, built-in graphs of your performance, programmable workouts using a simple graphical wizard, a detailed logbook, and capturing and emailing workout data. ErgIQ lets you connect a compatible Garmin Connect IQ enabled device with a Concept2 PM5 to record your workout metrics. 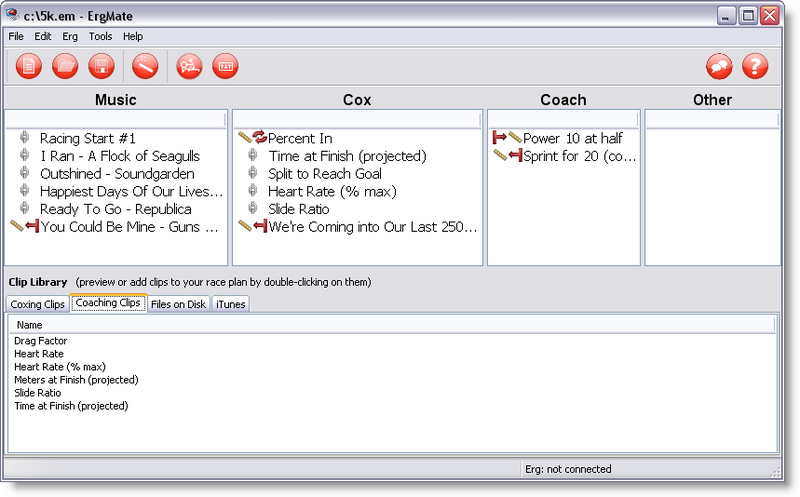 A virtual coxswain and indoor rower controlled music player that runs on your computer as you row. 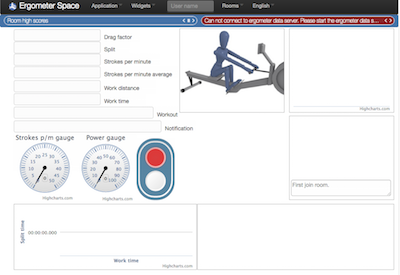 A free web-based application for your Concept2 Indoor Rower. Features include a dashboard, racing together in real time, a power curve advisor with spoken advice and writing your own ergometer widgets. Mac and PC compatible. 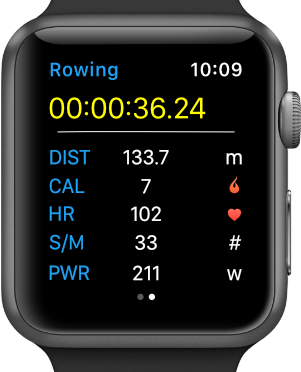 With Float, track all your indoor rowing workouts on iOS or Android. 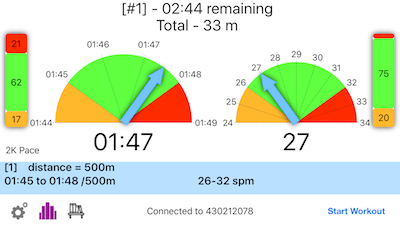 This free app will record all the data produced by the Concept2 PM5 monitor directly to your phone, letting you see in greater detail how you accomplished your last workout or that personal best. HOLOFIT™ is fully immersive virtual reality fitness software. Row in Space, Tropical forest, Ancient Babylon or Antarctica, compete with others, challenge yourself and see how you progress. New content and workout features come regularly to help provide motivation and entertainment. Connect your PM4 or PM5 to a VR ready PC and VR headset and start your HOLOFIT™ adventure. Kinomap adds a visual experience to your Concept2 Indoor Rower and BikeErg. Choose a video from the thousands of miles of user generated content and train. Watch your icon progress on the map as you follow the video. Compatible with PM3, PM4 and PM5 monitors. LiveRowing is a free application designed to run on iOS devices. It requires an iPhone Connection Kit or a PM5 to connect to the Concept2 Indoor Rower. 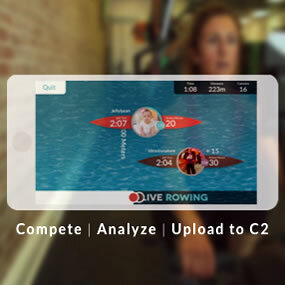 Once connected, LiveRowing allows you to compete with friends or yourself. It also has Featured Workouts from organizations and trainers around the world. The LiveRowing Affiliation product allows for rowing clubs, fitness centers and schools to have their own private rowing platform. This allows for coaches and trainers to build and send custom workouts to their members, local leaderboards and a coaches dashboard with detailed rowing analytics. Interested in developing ICT applications to process data from your PM3 or PM4? Simplify the task with this software tool. 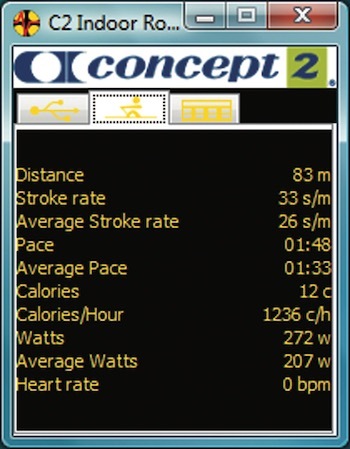 PerfPRO Studio is a fully stand-alone training and performance analysis application that supports as many bike trainers, indoor bikes, indoor rowers, and treadmills as you need. PerfPRO Studio is capable of handling single home use to very large group settings with just about any type of Windows computer. You may also mix up the trainer types and indoor rowers to allow a high level of flexibility in your studio. Currently supports indoor rowers with PM4/5 monitors, BikeErg, and SkiErg. Race Pace Row is a training tool to help in developing race pace and in interval training. You set targets for pace and rate for each interval, and the app will track how well you stay on-target. For each interval you can define either a minimum and maximum value, or a single target value. The race pace is entered by the user, and interval timings will update automatically to reflect any changes as the user improves. You can review your workouts within the app, and upload them to the Concept2 Online Logbook. Liven up your workouts, get serious with some figures and analysis, or develop your own project for the Raspberry Pi. RowPro is software for indoor rowing at home that will provide structure, motivation and feedback. RowPro provides a personal logbook with stroke data, custom training plans, precision 3D graphics, and live online rowing with people worldwide. Works with PM3, PM4 and PM5. Personal, Dual or Multi options. 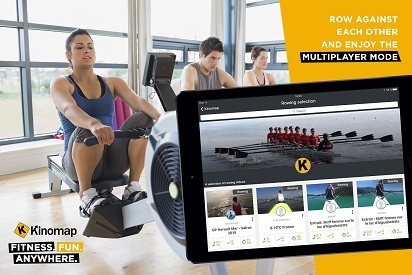 RowPro Multi is multi-erg software for indoor rowing coaches. RowPro Multi connects with up to 8 ergs via USB and provides multi-erg group training, venue racing, 3D stroke technique coaching, structured training plans, logbooks, precision 3D graphics, and live online rowing. For Windows and Mac. Works with any mix of PM5, PM4 and PM3 monitors. Quad, Crew or Club options. ROWViGOR is designed to run on iOS devices. Set up an account to track data and then use the app to get fit rowing down a famous river or taking rowing based fitness classes that combine rowing with other exercises like kettle bells, body weight movements or bands. ROWViGOR is designed for use with Concept2 Indoor Rowers with PM5 monitors and can be connected via Bluetooth. Selfloops Group Fitness Premium: An advanced application and platform for real-time tracking and analysis of group rowing/skiing activities. Multiple Concept2 Indoor Rowers or SkiErgs can be tracked in real-time in a tablet or a large screen. After the sessions, the activities can be uploaded on the Selfloops platform for further analysis. The Selfloops Apple Watch app connects to the PM5. Compatible with the RowErg, SkiErg and BikeErg, it can track your workouts as well as taking heart rate information from your Watch. Results can be uploaded to the Logbook via the Selfloops website. 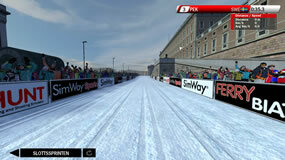 SimWay XC Ski by Simway Sports will let you compete and train at the world cup tracks of Stockholm and Östersund with your SkiErg. 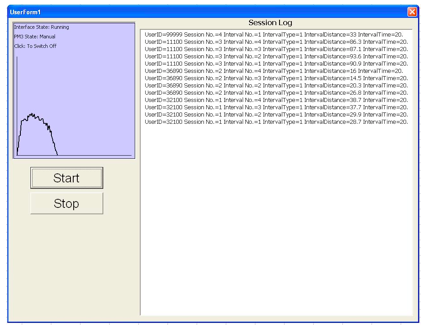 Download the free software, connect the SkiErg to your PC with a USB cable and you are ready to race! Do you have two SkiErgs? Connect them both and challenge your friends to a race with a split screen! The Sufferfest gives you access to a library of structured cycling, triathlon and running workouts designed by world class coaches and sports scientists. 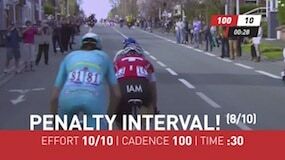 With exclusive footage of the world's biggest professional races and engaging storylines and soundtracks, you'll almost forget how much you're suffering. 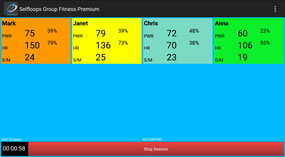 Advanced fitness assessments lets the app personalize each workout to your fitness level. Currently supports the BikeErg only. For rowers, skiers and other erg users. For PC and Mac, Training Mate connects directly to your Concept2 Indoor Rower or SkiErg Performance Monitor (PM3, PM4 or PM5) to give you immediate feedback on your performance against your training goals. Build and execute the training routines that work for you. Target the performance areas that matter to you. Available now with a free 30-day trial to get you started. Sign up, log in, and start riding. 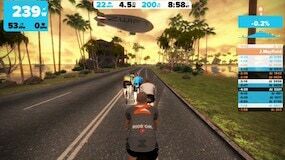 You’ll immediately join a community of fellow riders cycling in your choice of three virtual environments. There are group rides for all abilities, plus training plans, races and messaging. Currently supports the BikeErg only.